When Cleanliness Means Good Business | Trienekens (Sarawak) Sdn. Bhd. GREAT FOOD…Siti (left) and her workers strive hard to provide great food in a comfortable and clean setting for their customers. 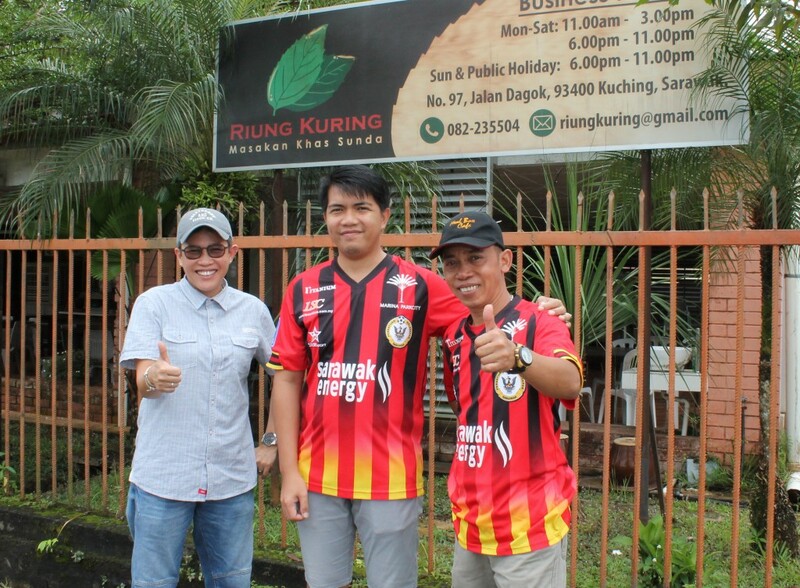 KUCHING: Home-based food business ‘Riung Kuring’ owner, Siti Aminah bt Adenan, fully realises the importance of keeping her restaurant clean, safe and pleasant for customers. On a typical business day, her restaurant generates about 30-40 kgs of waste. Come weekend, the volume escalates as the kitchen prepares more food for the increasing patronage. 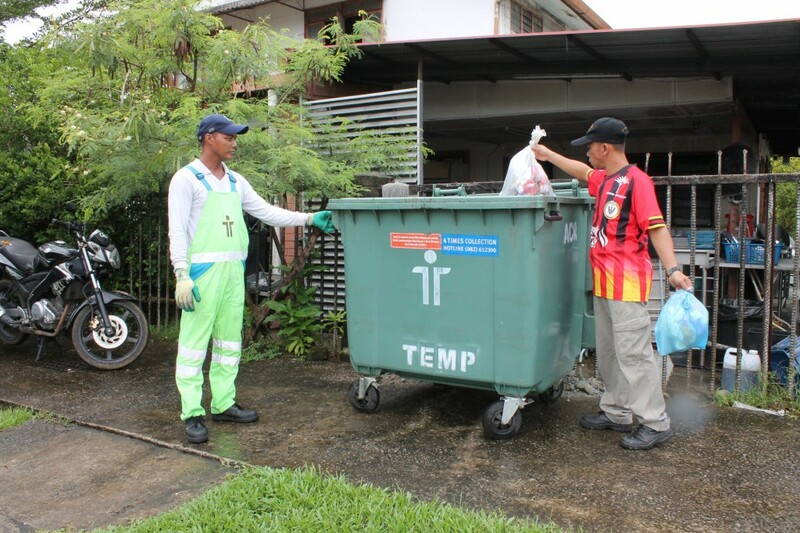 Such amounts of waste could not possibly fit inside the typical entitlement garbage bin, and Siti Aminah would also have to deal with the multiple possible risks resulting from overflowing waste. CLEAN PREMISE…Ruing Kuring Restaurant’s worker placing the kitchen waste into the 1000-litre bin before it is being serviced by Trienekens’s staff. 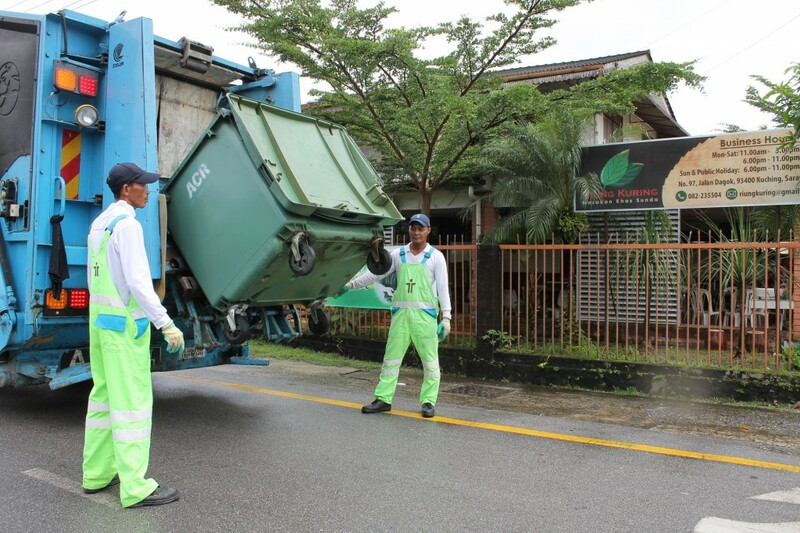 Siti is among the many business owners in Kuching who utilise the Additional Collection Request (ACR) services provided by the city’s local councils through their main waste management operator, Trienekens (Sarawak) Sdn. Bhd. ACR services are available at affordable fees to complement the standard bin and service entitlement for businesses; offering convenient, efficient and cleaner options for business operators whose waste disposal needs are beyond the standard entitlements. These monthly fees are charged based on the additional bin size, or the additional collection frequency. With ACR, business owners are able to maintain the cleanliness of their premise at a level equivalent to their waste management needs, while incorporating environmental responsibility into their business model. While meeting customers’ high expectations of hygiene and safety, this can help boost the company’s bottom line in the long run. Another ACR subscriber, Ms. Teo Tze Ting from the ‘New Chef’s Delicious’ restaurant, agreed that keeping their business environment clean was of utmost concern to the outlet’s management. Speaking on behalf of the restaurant, she stressed that they (the restaurant) now have enough bins to accommodate the eatery’s mounting waste. “Without sufficient bins, the waste would overspill and attract pests or stray animals that would rummage through the waste, creating a foul smell at our restaurant, which is definitely something we don’t want our customers to experience or complain about,” she said. Under the ACR services, ‘New Chef’s Delicious’ currently has seven 240-litre and 660-litre bins and enjoys a collection frequency of six times a week. Ms. Teo added that the additional services have been consistent and they are happy with the services provided by the council through Trienekens. Another ACR user representing ‘Rock Road Seafood Restaurant’, Ms. Jenny Ng, believed that maintaining a clean environment gives customers a good impression of their business. “With increasing trust and loyalty, our customer base can grow,” she said. Cleanliness is an essential part of any successful business, particularly for eateries or food outlets, and other medium and small industries. All businesses should comply with the relevant local laws related to public health and environment, and as a responsible member of the community, local businesses should demonstrate an exemplary duty of care towards the environment by engaging in the best practices of waste management in their daily operations. In addition, a clean environment is definitely a big selling point and creates a competitive edge for any businesses. It illustrates the companies’ effective role as responsible members of the business community, caring for the well-being of the environment and public health. To know more about ACR services, business owners can contact their respective local councils. ADDITIONAL SERVICE…Trienekens’s team servicing Ruing Kuring Restaurant’s additional bin.